"Venezuelan leader Hugo Chávez is moving to consolidate his hold on Honduras, after orchestrating the return last Saturday of his puppet, Manuel Zelaya. Officials in Chávez’s inner circle are wondering how their cash-strapped government can finance yet another “revolutionary” government in Central America. What they fail to realize is that Chávez’s backup plan is to sow chaos in Honduras so it is hospitable territory for his partners in the illegal drug trade and a headache for the United States and Mexico. "Sources within the Venezuelan foreign ministry are delighted that Honduran President Porfirio “Pepe” Lobo was so quick to pledge his loyalty to Chávez and the same radical reforms that got Zelaya deposed in 2009. "Lobo’s surrender came at a secret meeting in mid-May with Venezuelan envoy Ariel Vargas, held far from the presidential palace at Lobo’s suburban home northeast of the capital. According to sources inside the Venezuelan government, Lobo posed as a fervent revolutionary and begged for Chávez’s patience as he maneuvered around domestic opposition to fundamental constitutional reforms that will allow the people to sweep aside the old order. Lobo suggested to Vargas that he needed help in neutralizing opposition within his own Nationalist Party and the Catholic Church." "Venezuelan diplomats familiar with Lobo’s offer agreed that the most appealing part of his proposed pact is that they would no longer have to rely on the mercurial Zelaya, whom they have come to regard as a clown and a pest. 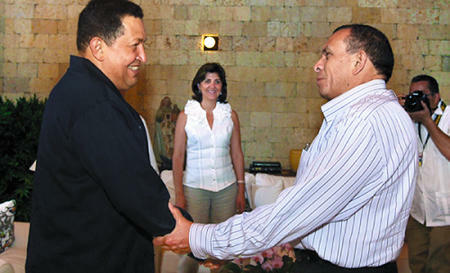 Chávez will let Lobo believe that they are partners, but the Venezuelan will never accept the rightist Nationalist Party president as an instrument of radical change. Instead, Caracas already has begun to pour millions in support to the National Front of Popular Resistance (FNRP), which will soon be accredited as a political party as part of the “national reconciliation” deal imposed by Chávez. By fabricating a well-financed rival to Honduras’ two traditional political parties, Chávez is convinced that he can rout the opposition and install minority governments to push through drastic economic and social changes." "For Chávez, Honduras is a win-win-win proposition. If he manages to install a friendly government, he will have a malleable partner who will join the conspiracy against the United States. If his machinations merely sow political chaos and social mayhem, his allies in the illegal drug trade will prosper. And, in either case, saving Honduras will require heavy lifting and substantial support by the United States." Roger Noriega is a former Assistant Secretary of State for Western Hemisphere Affairs (Canada, Latin America, and the Caribbean) and a former U.S. Ambassador to the Organization of American States. No doubt there will be immediate claims that this is ridiculous and false, but it rings very true to me. It is 11:50 as I begin to write this and Mel Zelaya is a no show so far. Free trips to Tegucigalpa were offered from around the country yesterday to ensure the cheering crowd would be in place with no delays. The crowd was in place by 9 a.m. HCH TV has reported that some are becoming uncomfortable with the delay. So far this morning, there has been a festival atmosphere with musical entertainment and a few speakers, though some have complained that certain Resistance leaders, like Juan Barahona, were noticeably missing. There are absolutely no police or military in sight and no repression of the activities. All of the television stations are operating normally. A media helicopter has been circling the area for almost two hours. A large force of soldiers is in place to protect the airport if necessary, but they are far away on the other side of a fence and the other side of the runway. This is an operating commercial airport and other flights have been coming in normally, including an American Airlines flight. Each time a plane comes in a weak cheer from the crowd arises until they realize that it isn't Mel's plane. Typical of Mel to think that the world (and airport) revolves around him, not to mention that a formal luncheon with all dignitaries, including Insulza, is waiting for him. If his flight is delayed because he missed his planned arrival time of 11:00 a.m., no doubt the government will get the blame. Oh, I am laughing right now! 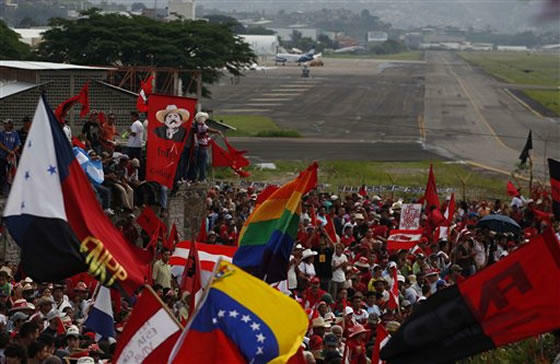 Campesino leader Rafael Alegría on TV Globo has just said that they calculate the crowd to be around a million! Watch for your US news to be reporting that fallacy tomorrow. I would estimate the crowd to be around 2,000 people. Maybe to be generous, you could stretch it to 3,000-4,000. Judge for yourself from the photos and video that I will post later. At 12:12 p.m., an announcement was just made saying that he will arrive in 10-15 minutes. El Jefe is getting bored and hungry and planning to go watch the game which starts in about 45 minutes. I'll be updating this article with my photos and video. At 12:34 p.m., an announcement was made that Zelaya would arrive in 3-5 minutes, but one channel was showing "live" video from Nicaragua and the entourage had not even left yet. El Heraldo is reporting that President Ortega is not coming after all. It's now 12:47 p.m., and nothing yet! These people have been standing in the hot sun for hours. 1:07 p.m., another plane just arrived, reported by CholusatSur to be Zelaya, but Telesur is showing a live video of Zelaya speaking in Nicaragua! 1:35 p.m. (getting ridiculous, huh?) and still no Mel. The media keeps reporting that he will be here in 5 minutes, but Telesur only says "within the hour". The crowd is increasingly less animated — because they are hungry! Some interviewees said they hadn't eaten today and one mentioned that his group has been there since 6 p.m. yesterday. Some are complaining about the disorganization and apparently now it is starting to rain. This is all so typical of Zelaya — also typical is that the Resistance is getting the blame for the disorganization, not Mel. I'm beginning to feel foolish for wasting my day with this nonsense. I can't imagine how disrespected the crowd, who have traveled so far, feels. 2 p.m. Zelaya's plane is said to be in the air. The 'news' of many of these TV stations consists of phone calls and reading text messages from viewers. Many of the messages are becoming increasingly angry. The journalists always say that it isn't Mel's fault. CholusatSur (for the 4th or 5th time) has announced that Mel has arrived. Gotta go.... No, another false alarm. 2:15 p.m. I can't upload my photos or work on my video as I have to keep the camera at the ready — like all the other folks who have been waiting for hours. Five more minutes, five more minutes, five more minutes. The crowd is going to be angry by the time Z arrives. If he tries to blame the delay on Lobo....who knows what might happen. Three hours and 15 minutes late, and still counting. 2:45 p.m. His plane landed about 2:35. He and the diplomats are going through immigration and customs formalities now. The crowd is waiting quietly. 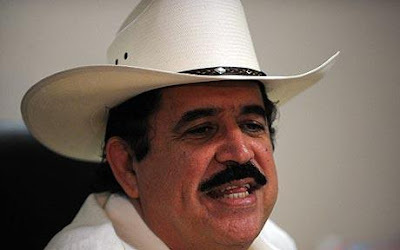 In a telephone interview with Telesur from the plane, Zelaya spoke of the golpe he suffered but evaded questions about whether he was coming back to lead the FNRP or whether he would be pushing Lobo to join ALBA. 3:00 p.m. This crowd has been waiting for four hours to see their leader! Some have been waiting since 6 p.m. yesterday. I guess Insulza and the other dignitaries waiting to welcome him have been waiting a few hours for their lunch, too. Total lack of respect for everyone, most of all the pueblo that he claims to represent. It's all about Mel. Always has been. 3:20 p.m. The crowd has increased by, oh, I would guess 1,000, maybe more. A couple of hours ago, I told El Jefe that I bet that Zelaya is waiting for a larger crowd before he comes. Call me cynical, but I'll bet that the Resistance leaders sent out buses to pick up more people. Still no Mel. 3:21 p.m. What was that old Gerardo show building up the suspense for opening a treasure chest or something and then there was nothing there? Anyone remember that? I feel like Gerardo must have felt. Additionally, I seriously doubt that my batteries or my shaky hands will hold up for any speech from Zelaya. If Patricia Rodas is there, forget it! 3:32 p.m. Incredibly, Zelaya is on the stage giving interviews to reporters with his back to the crowd who have been waiting in the hot sun for 4 1/2 hours. I'm just flabbergasted. 3:50 p.m. I was attempting to get Zelaya's speech when my camera card filled up. Apparently it is going to take 30 minutes to download all the videos and I can't use my camera in the meantime. Darn! Anyway, Zelaya thanked Hugo Chávez to huge cheers from the crowd. He thanked Pepe Lobo and the crowd was silent. All the corruptos are there with Zelaya. 4:03 p.m. Oh, he's back all right. Honduras needs to get back into Chávez's ALBA and the US is the devil. 4:15 p.m. Various foreigners are giving speeches with pregnant pauses waiting for wild cheers for Chávez, ALBA, socialism, etc. Very interesting but those cheers are very, very weak or sometimes missing entirely. They look surprised and a little embarrassed. 4:35 p.m. Well, all in all, the speech wasn't much. Mel spent more time in the greetings and the thank you's than the actual meat of the speech, which I basically covered above: ALBA! Chávez! Golpe! Patricia Rodas, who some say was the evil mind who led Zelaya astray and ultimately resulted in his downfall, gave some interviews in which she was her same old divisive self, ranting about the golpe and saying this was just the beginning. There was no talk from Mel or anyone else that even hinted at reconciliation. Anyone who was truly interested in reconciliation would be talking about the future, not about golpistas. I've heard the word 200 times today. And that's it! I'm done. I lasted longer than many of the television stations who went back to regular programming even before Zelaya's speech was finished. It all gave me a headache. I don't know if I even have the interest or energy to go through all those videos or whether anyone would have the interest in watching them..... signing off at 4:45 p.m.
BTW, I'm very happy that there was no violence! Tomorrow, May 28th is the big day. The second coming of the messiah, or at least that is how the return of the former president Mel Zelaya is being treated in some quarters. I don't know how Zelaya could possibly live up to the expectations. For that, I am sorry. Not sorry for Mel, but sorry for the people who think that his coming will somehow change their lives or prospects. I'm also very worried about what is going to happen tomorrow. The FNRP marches have often resulted in violence. I'm afraid that the 'show' tomorrow is not only staged to show Mel's popularity, but also may be to show that Honduras is ungovernable and for that, "the conditions are not right" for Honduras to be accepted back into the OAS. In a really strange twist, Andres Pavón, pro-Zelaya head of CODEH, announced to the media that Zelaya was only returning for 24-hours to test the waters, so to speak, regarding his personal security. Pavón is the same person who exposed a 'conspiracy' right before the 2009 elections, claiming that he had proof that the military was going to massacre 1,200 UCD members (white shirts) in order to blame the massacre on the Resistance. Yes, that makes no sense and no one paid any attention to his crazy claim, but it shows the type of person he is. I have no idea what his purpose was in making this statement about Zelaya. Both Juan Barahona and Mel Zelaya instantly denied Pavón's report, saying that Mel was coming to stay. But the whole thing got me thinking that a big riot (or worse) is the plan, using it as 'proof' of Honduras' lack of human rights, Zelaya's inability to be safe in Honduras, or proof of repression by the security forces. Mel could go back to his life of luxury and security in the Dominican Republic and continue to cause harm to Honduras while playing the victim to the international community. The FNRP seems more anti-everything than ever these days. Various factions of the FNRP have come out against their own leaders, against Mel Zelaya, against the Cartagena Accord, against Pepe Lobo for signing the Accord, against Honduras rejoining the OAS, against becoming a political party, against reconciliation, even against a plebiscite to hold a constitutional assembly, which has been their main demand from the very beginning. It would almost be humorous if it wasn't so seriously sad for Honduras. The FNRP has been promoting division and hate, and even violence in some cases, for two years now. It could all backfire on them and on Zelaya. When you train a dog to bite, sometimes you can't control them when you need to. Preparations are being made — t-shirts and flags are being printed, 400 buses have been hired to transport anyone who wants to go to the party from all over the country. One expatriate asked his neighbor who was paying for all that and the response was "Who cares?! It's all for free!" Another Facebook friend mentioned that the "ricos" were getting onto planes to leave Tegucigalpa. José Insulza, Secretary General of the OAS, is here, too, to welcome back Zelaya. They will all be having lunch at the presidential palace tomorrow. Hopefully Insulza will stay safe in his luxury hotel during the melee because the last thing that we need is for something to happen to him while he is in Honduras or to Zelaya either. The FNRP have demanded that the police or military not be there or along the route. As of the latest word, the security forces have agreed. Of course, Lobo has guaranteed Zelaya's safety so there will have to be some around him. I wouldn't want to be in Lobo's or Minister of Security Oscar Alvarez's shoes right now. There are no good solutions. They are going to be damned if they do and damned if they don't. Mel will also have his own security to protect him against the protectors. Really I'm just speculating about all this, but I am very worried. This is a group that wants martyrs. I'll be glued to the television tomorrow — probably with my laptop right in front of me. But I'm a world class worrier. Don't pay any attention to me. Almost four thousand Hondurans believe the game tomorrow is more important than Zelaya's return. I predicted that one of the first steps after the signing of the Cartagena Accord would be Honduras signing a Petrocaribe agreement with Venezuela. Honduran President Lobo said that Venezuela's Foreign Minister Nicolás Maduro brought it up during the signing: "And Petrocaribe? ", to which Lobo responded by saying that if offered, he would jump on a plane on Monday. 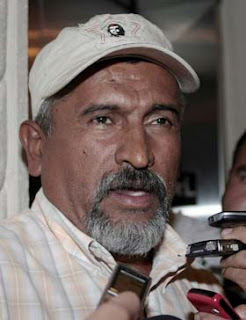 The idea of rejoining Petrocaribe has already been tossed around to the Honduran media for the past two months, surprisingly first mentioned by prominent businessman Adolfo Facussé, widely considered by pro-Zelaya forces to be a golpista and strongly anti-socialist. He and high level government officials, including Pepe Lobo, publicly and falsely implied that Petrocaribe would mean lower gas prices for Hondurans at the gas pumps. Petrocaribe is an organization in which member states purchase fuel at market rates from Venezuela. The benefit is that the countries only have to pay 50-60% of the purchase within 60-90 days and are able to finance the rest for 25 years, including a 2-year grace period, at 1% interest. Payments in the form of goods or services may be accepted by Venezuela. 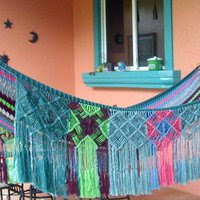 The amount financed is supposed to be spent on social projects to help the developing countries. In theory, it sounds good. In practice, not so much. Supposedly, US $104 million of Honduras' Petrocaribe funds are still sitting in a bank account somewhere, but that in itself is very odd (if true) since the money was supposed to be used for social development projects. Here we are in 2011, three years and three presidents later, and none of the money has been put to use in this impoverished country? In a January 28, 2008, Wikileak cable, former US Ambassador to Honduras Charles Ford wrote: "Zelaya may also think he can evade the conditions of both Petrocaribe and other donors and divert the funds to cover current spending, for corrupt ends or for the political campaign of his preferred successor, Patricia Rodas." The Petrocaribe agreement gives no requirements about how the money is to be used or accounted for and there are no reporting or auditing requirements. It's impossible to know whether all of the financed funds were ever deposited or were diverted along the way. A transparency committee was supposed to be formed to oversee the administration of the funds, but I don't think it ever was since the media was constantly asking, "Where's the money?". Certainly we would have heard about it if the funds had been used for social projects, since the Honduran government spends millions on publicity every year telling us of the good deeds that they do. The money may have partly been used for the government's 2008-2009 operating expenses or the hugely expensive Cuarta Urna publicity campaign, or maybe even just distributed directly to Cuarta Urna supporters. Zelaya's former Minister of Finance Rebeca Santos (who is also facing corruption charges) refused to provide the media with any accounting of the Petrocaribe funds despite constant demands in 2008-2009. You can read a brief description of Petrocaribe at Wikipedia. (Note that this article is not updated. 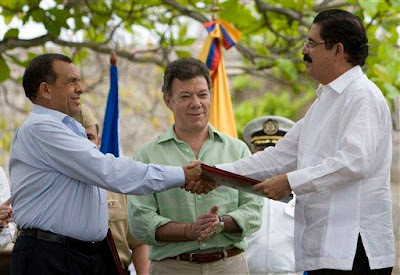 Honduras formally ceased being a member in 2009 while under Micheletti, but Chávez had already unilaterally and without the required 60-day notice stopped shipping fuel to Honduras on June 29, 2009.) During the period of January through June 2009, Petrocaribe and ALBA accounted for 71% of Honduras' external financing according to Maurico Díaz of FOSDEH, an independent organization that monitors Honduras' foreign debt and development. According to Joel Hirst, a respected researcher for Council on Foreign Relations who is writing a book on ALBA, the reality in countries like Nicaragua is that the main benefit is actually a massive slush fund that is used (at the expense of future governments and future generations) for controlling the media and ensuring reelection of Chávez-approved candidates, as well as making multi-millionaires of those officials. Mr. Hirst told me, "But the short story is the prices don't actually come down, it is a method to transfer money to the [political] leaders. Chavez has the same deal with his Petrocaribe El Salvador, but instead he transfers the gas to 22 FMLN municipalities who pay back half and transfer the other half to the party coffers." Hirst went to explain how Petrocaribe works in Nicaragua: "Basically, you [the Nicaraguan government] pay 50% up front. At the pump, the buyer pays market rate. The other 50% goes into this company called ALBANISA controlled by Ortega's son. Of that, 25% is funneled back to Chavez and 25% is funneled into ALBACARUNA which is a micro-finance institution which currently has about 500 million in liquidity. That's where they pulled the money for all the social programs, the re-election campaign, and the purchasing of hotels, TV stations, etc. The other 50% to be paid immediately to the Chavez government can be repaid in kind. So Ortega takes his 25%, buys fincas [farms] and ranches, and has the PetroNIC buy the stuff (at a high price) from his fincas and ranches to pay back the 50% owed to Chavez. It's what they call a "negocio redondo"." Lobo also mentioned a fertilizer deal with Venezuela. According to Hirst, this is but another piece of the puzzle: "But in Nicaragua, it's broader than PetroCaribe. Venezuela has provided 500,000 tons of fertilizer to Nicaragua which is treated in roughly the same fashion. This has made Ortega the wealthiest man in the country." Initially, the Honduran media regurgitated the lower gas price lie, but have since begun to report the truth after asking harder questions of the politicians. Lobo now admits that signing Petrocaribe would not mean lower gas prices. But the fable is easy to sell to the common folk, who believed Zelaya when he personally took credit for lowering gas prices in television ads. After all - they saw it at the gas pumps! Never mind that the price of oil in the world market went from around $110 per barrel when the congress approved Petrocaribe in mid-March 2008 down to around $46 a year later. A channel 10 viewer poll just this week showed that 67% of the callers believed that Petrocaribe would bring the benefit of lower gas prices to their pockets, even though that particular news organization was reporting the truth about the contract. A May 10 comparison of Central American gas prices showed that Belize and Nicaragua, both Petrocaribe members, had the highest prices at US $5.98 and $5.15, respectively. Non-Petrocaribe Honduras was right in the middle of the seven Central American countries with a price of $4.76 (all prices based on the cost of regular gasoline). With gas prices beginning to fall in the world market, this is the perfect time for Honduras to join Petrocaribe. Consumers will begin to see the lower prices at the gas pumps and won't be as tempted to demand transparency for the funds. Don't be fooled by false promises and red tractors. Read the Petrocaribe agreement [in Spanish] for all the proof that you need. One last ironic point, in 2008 when the Liberal-led Honduras congress approved the Petrocaribe contract, the Nacionalista party abstained from voting. 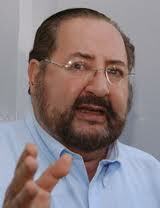 Party leader Rodolfo Irias Navas spoke out against indebting Honduras to Hugo Chávez. Now the Nacionalista party is in power and they are pushing for Petrocaribe. It's all politics, isn't it? As Congressman and caricaturist Dario Banegas illustrates in the cartoon below, entitled 'Melobo', sometimes it is hard to tell them apart. 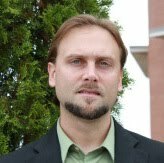 A complete list of Joel's articles (both in Spanish and English) can be found here. Mel Zelaya's entourage and what's next? 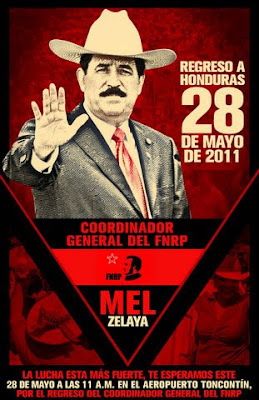 Juan Barahona, sub-coordinator of the FNRP (Resistance movement), has announced that former president Manuel "Mel" Zelaya will return to Tegucigalpa, Honduras at 11 a.m. on Saturday, May 28. Accompanying Mel will be Nicaraguan President Daniel Ortega and Nicolás Maduro, Foreign Minister of Venezuela and Chávez' right-hand man. Both men are strong XXIst century socialists and strongly anti-US, a country which they refer to as the imperialists, blaming imperialism for all the woes of Latin America. 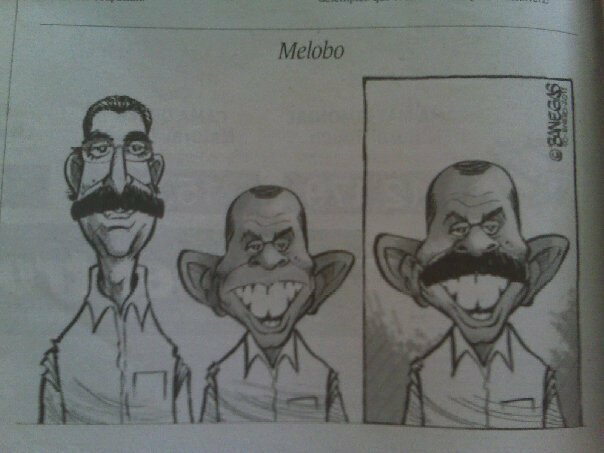 Also accompanying Mel will be one or more unnamed former Zelaya cabinet members — or "all of the exiles" according to Barahona [in Spanish]. Most, if not all, of the 'auto-exiles' have corruption and abuse of authority charges pending against them. But what is good for the goose, is good for the gander.... despite Honduran President Lobo's election day promise that "all corruptos will go to jail, en punto! ", he seems willing to make any deal with anyone in the name of 'reconciliation'. I saw him on television tonight and I have to say that he looked more stressed than I have ever seen him. The Resistance has promised a massive turnout of people to welcome back Mel and the show won't be complete without showing the world "repression by the golpista security forces". My guess is that there will be orchestrated lawlessness and violence to provoke action on the part of the police, complete with video cameras at the ready to capture only the second half of the action. Lobo has promised to provide protection for Zelaya. Juan Barahona is a union leader, member of the former Honduran Communist Party and long time "revolutionary" who recently returned from a visit with Castro in Cuba. This interview, translated to English, tells how the four conditions (which were not mentioned by Lobo or Chávez or even Zelaya after the Lobo-Chávez meeting) came about. Since any demands imposed by Chávez or the US would be looked upon with great suspicion both within and outside of Honduras, the proposal was softened by including neutral Colombian President Santos. (Where is Wikileaks when you need them?) Oddly, in a public comment after the original "mediation", Chávez said that he understood that the Resistance only included about 5% of the Honduras population and that a constituyente wasn't necessary anymore because the Honduran congress had passed an amendment to the plebiscite and referendum law, seemingly stabbing the FNRP in the back, at least publicly. 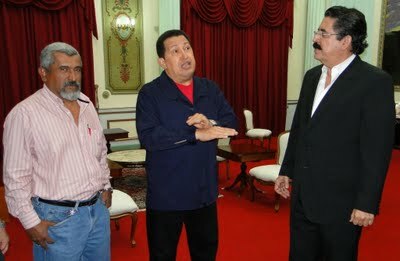 A week after the meeting in Colombia, Barahona, other FNRP leaders and several ex-Zelaya cabinet members met with Chávez and Zelaya in Venezuela specifically requesting the four points which Zelaya later announced as though they had been part of the original talks. Juan Barahona, in the referenced article, boldly predicts that "on June 28 the auto-convocation of the National Constituent Assembly begins." He further states that they have fear that Lobo will sign an agreement but later not fulfill the terms after Honduras has been accepted back into the OAS so the FNRP has proposed a "Verification Commission" in which Presidents Santos and Chávez will guarantee the agreement is complied with. Colombian Foreign Minister María Holguín arrived unexpectedly this week to meet with President Lobo but the media was unable to find out what was agreed to or whether any documents were signed. Lobo is not talking. Barahona also says that as a part of the human rights requirement, they have demanded punishment of all who took part in the June 28 "coup". 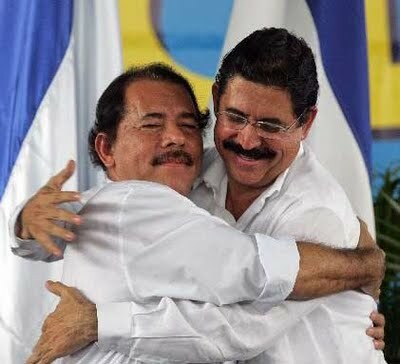 Zelaya has often spoken of vengeance against the golpistas, despite the prior agreements to provide amnesty for all political crimes. 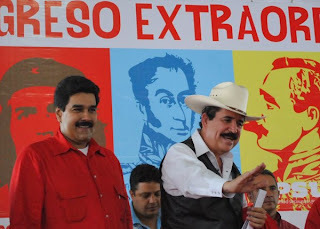 At least one FNRP faction, however, took objection to Zelaya and Barahona's dealings with Chávez, stating that the agreement blessed by Zelaya, Barahona, and other FNRP leaders has "been given very untransparent treatment by the leadership committee of the FNRP, which has manipulated information, kept secret the documents of the accord, and unreasonably refused to account for its actions before the full coordinating committee". Much of the same could be said about Pepe Lobo. I don't believe that in a fair election a Constituyente would be approved because the vast majority of the population would vote against it, but, on the other hand, rumors abound that both Lobo and Juan Orlando Hernández, President of the Congress and strong potential 2013 presidential candidate, would both love to see reelection of presidents allowed. They have the means and ability to both manipulate public thinking and public spending (and thus public opinion). Currently Lobo's popularity rating is in the dumpster, even lower than Zelaya's was at his worst, but enough handouts in the right places could turn that around, just as it did for Zelaya. Honduran blogger Ardegas wrote an excellent article [in English and in Español] analyzing Lobo's first year in office that I think represents the view of many Hondurans. But the general unhappiness with Lobo's government from all sides of the political spectrum might result in many people deciding that anything would be better than the current corrupt system. Additionally, many people vote the party line regardless of what it might mean for the future of the country, so if Pepe says 'go', it's a go for them. In Nicaragua speaking the Foro de Sao Paulo, Zelaya himself interestingly says only that he "possibly" will return in the next days, "si Dios quiere" [article in Spanish]. El Heraldo quotes him as saying his lofty purpose is to "restore liberty and the political processes in Honduras". 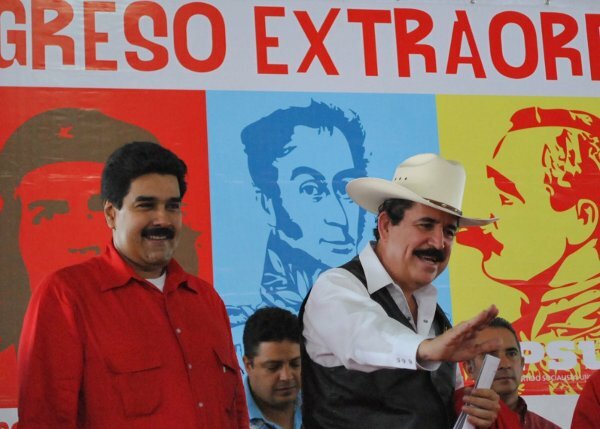 In his discourse at the forum, Zelaya sang the praises of both "Comandante" Ortega and "Comandante" Chávez. 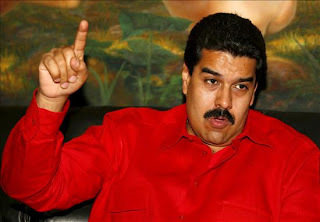 Zelaya denounced capitalism as generating corruption and violence, pointing out that imperialism has been the cause of all 144 coups in Latin America and that, with every day that passes it is proven that the US, its government and the US Department of State were behind the coup that provoked his exit from power. He sarcastically exclaimed, "What a coincidence!" that four of the six coups in the 21st century were in ALBA countries, wildly stretching even the the most liberal definition of a coup. "Capitalism is the antonym of democracy and socialism is the synonym of democracy." Mel Zelaya loves being in the limelight and loves playing the victim, as he often did while president (see this 2007 article, "Oh, boo hoo, everyone is against me"). In the past year and a half, he could barely even get coverage in Chávez' Telesur. Out of desperation for coverage, he recently spoke for more than 3 hours to a surprised Mexican reporter. We should be in for some good shows in the coming weeks, but I don't think it will last much longer than that. One of Zelaya's flaws is that he gets carried away with himself when speaking. Another flaw is that he doesn't seem to remember what he said from one speech to the next — or possibly thinks that others don't remember. But most of all, I think that he is deluded about how much power and influence he really has in Honduras. Zelaya is going to become just another ex-president and a clownish one at that. With Honduras in the OAS, they won't need him anymore. His specialty is dividing, not uniting the people and reconciliation is the last thing on his mind. I think that will become clear very soon. He doesn't really have any concrete ideology other than first looking out for numero uno. He's been using the Resistance because it was all he had. If, for an extreme, non-probable example, he were to be named the head of the Liberal party (which he won't be! ), he would drop the Resistance and its ideology like a hot potato. After all, he is one of the elite despite his (and others) attempts to jump on the Resistance bandwagon and pretend to be one of the common folk. As he begins to recognize his lack of influence, his speeches will become more extreme and radical until finally no one will want to listen to him. Hopefully he will not encourage violence as a means of showing his perceived power. Rasel Tome just announced to Habla Como Habla television that exiled former president Mel Zelaya is returning to Honduras next weekend. He wouldn't say when Zelaya would arrive, only that he was coming into Toncontín airport in Tegucigalpa and that it would be Friday, Saturday, or Sunday, May 27-29. He implied that the Honduran government had conceded to the four points that Zelaya insisted upon after the meeting between Honduran President Pepe Lobo, Venezuelan President Hugo Chávez, and Colombian President Juan Santos. I haven't heard Pepe Lobo speak of these requirements, particularly the constitutional assembly. These points were not announced in the press conferences after the meeting in Colombia and appear to have been something that Zelaya (who wasn't there) came up with in the days after the meeting. There has been no public indication whether Lobo has or has not agreed to these points. One of those points is that all of the "exiled" compatriots who escaped the country after June 28 (most likely because of their involvement in corrupt and illegal acts) return immediately and "securely". Whether that means body guards or immunity against prosecution, I don't know. Anything is possible in Honduras. Anything that is, except guaranteeing the safety of anyone. Another point was initiation of a plebiscite for a constitutional assembly. Respect for human rights was the third point. And finally that the FNRP (Frente Nacional de Resistencia Popular) be recognized as a "belligerent" political and social organization. There is nothing that I'm aware of preventing the Resistance from becoming a political party, but some leaders in the Resistance, which is a very divided group, have said that they don't want to be a political party. From his mansion in the Dominican Republic for the past month, Zelaya has been singing the praises of Hugo Chávez as the savior of Honduras who has done what no one else in the world was able to do: find an exit for the political crisis. Never mind that Pepe Lobo has been telling Zelaya that he can return whenever he wants to for more than a year. In his last comunicado of May 12, Zelaya demanded that the USA immediately pronounce itself in favor of the Chávez-Santos mediation. Last week, Zelaya's wife filed a denuncia claiming that she had been told of a plot to assassinate Mel, claiming a certain friend had told her of the plot. The friend immediately denied to the media that he had said any such thing. I predict that Honduras will shortly join Chávez's Petrocaribe as one of the under-the-table agreements that was made in Colombia. Several politicians and some businessmen have been issuing false and deliberately misleading statements that joining Petrocaribe would mean lower gas prices for Hondurans at the gas pumps. This makes the 110th time we have heard that Zelaya will return to Honduras. Will he? Or won't he? As I post this, not even the AP or the Honduran newspapers have reported it. Maybe Zelaya just isn't news anymore. Thanks go to El Jefe for the tip!